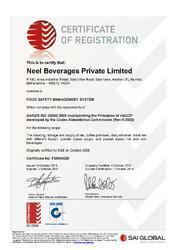 Established in 2008, we, Neel Beverages Pvt Ltd. are the manufacturer and exporter of Instant Soups, Instant Fruit Drinks, Flavored Milk Premix, Instant Iced Tea, Green Tea, Tea Premix, Tea Sachet, Instant Tea, Milk Premix, Instant Coffee, Instant Milkshake, Instant Nimbu Pani, Manchow Soup Premix, Rose Milk Shake Premix and Instant Coconut Water Powder. Under the guidance of our Director Mr Shripad Kulkarni, we have managed to attain greater heights of success in the past years of our existence. Her ability to understand the market, work hard, manage and make tough decisions, have inspired all our employees. 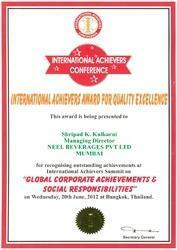 To us at Neel Beverages Pvt Ltd., providing quality is something of high importance. Thus our Processing process, involves the utilization of high grade ingredients in the best possible combination, following the norms and guidelines of the industry. This ensures the product’s effectiveness, shelf life and purity. Further, the offered range is processed through several rounds of quality examinations, where all manufacturing defects are eliminated with high level of precision. The highly advanced state-of-the-art infrastructural facility at Neel Beverages Pvt Ltd., has been parted into a number of highly operational units, in order to attain a better management of the firm’s operations. The facility, regularly upgraded, helps us in extending our reach in the market and in maximization of productivity. Further, the facility has been equipped with all the necessary machinery and equipment, for the facilitation of several of the firm’s predefines goals and targets. An ISO 22000: 2005 Certified Company: We take great pleasure to introduce ourselves as the India's first beverage company to obtain ISO 22000:2005 certification which is the international food safety standard dealing in Instant tea, coffee, soup, lemon tea, cold beverages. The company's growth is attributed to quality product, efficient sales & after sale service. People world over are appreciating this novel product & have blessed the company by spreading awareness of our products. The concept of ready to drink is very convenient to use & time saving. 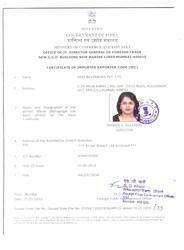 Certifications of Importer and Exporter. Our objective is quality product at reasonable price. Our focus is on improving the quality without changing the price. To maintain the high level of quality in our products the raw material procurement is very strict and are ensured to be of superior quality.